The first thing you notice about Derrick Campana’s workshop is the machinery. Between the ovens, sewing machines and vacuum tubes lining the walls, it’s easy to think Campana is a home economics teacher — until you catch sight of the dusty paw prints. Campana and and his team use the tools not for domestic projects, but to build prosthetic and orthotic devices for animals. Campana, one of the world’s leading experts in animal orthotics, is on a mission to give disabled pets and farm animals options for more mobile lives. Campana made the jump to the animal field 12 years ago when few, if any, people created artificial limbs for dogs and other pets. Campana figured there must be thousands of animals in need of these types of services. Over the past decade, Campana estimates he has treated more than 10,000 patients. More than 90 percent have been dogs, but he has also worked with a range of farm and zoo animals, from goats in New Jersey to rams in Spain and eagles at a Busch Gardens theme park. Two Asian elephants in Thailand, who lost front limbs in landmines, are among his largest patients. Campana proudly lifted the two massive casts of their damaged limbs to prove it. Made primarily from highly durable, medical grade plastic and foam, Campana’s devices cost, on average, between $500 and $1,200. They are crafted on plaster molds made from limb casts sent in from owners, veterinarians and rehab facilities around the world. Some animals will require multiple sets of prosthetics as their bodies adjust to new alignments, but Campana argues the effort is still a viable alternative to costly surgeries or euthanasia. Still, he cannot help every patient, no matter how much their owners might press for a solution to their pet’s mobility challenges. 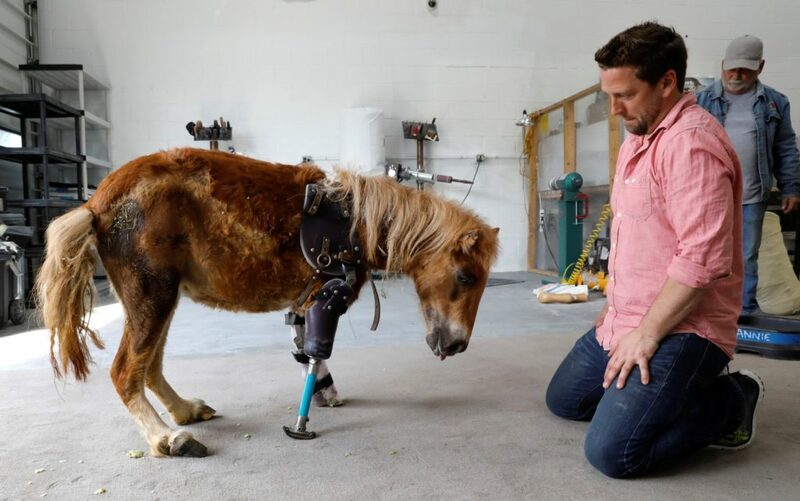 Angel Marie — a pony whose front legs were crushed by her mother at birth — was one of those tough calls. Campana ultimately crafted a brace and prosthetic limb for her. Even when successful, Campana’s work, especially with horses, does draw some criticism. “I feel like the equine field is like what the canine was 15 years ago, where they just wanted to put animals down instead of trying to put on a device to extend their life,” Campana said. He argued the continued success of these cases has begun to change the narrative toward broader acceptance among veterinarians. In the future, Campana plans to produce 3D-printed prosthetics — which, at the moment, cost more and are less durable — as well as devices made from low temperature thermoplastics that could be altered by owners at home with a hairdryer or other heating device. If an owner finds the prosthesis or brace is too thin and rubbing the wrong way, for instance, they could then heat it and slightly mold it into a more comfortable shape. When it cools, it becomes hard again. But for now, he is just glad to help the animals he can. “Seeing those dogs walk again, and their tails wag and their eyes glitter again, and it’s just the best feeling in the world, and it’s a job I’ll do until I die,” Campana said.